There's something in the air....something that's been coming on slowly the last few years, but suddenly...it's existence is undeniable. It's....the Return of the Homemaker! 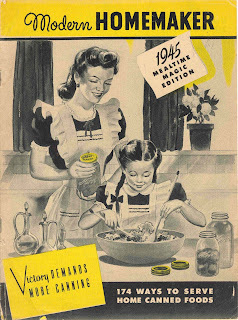 Oh, the homemaker has always been around. But over the last thirty or more years, the occupational status has really taken a hit on the cool quotient. 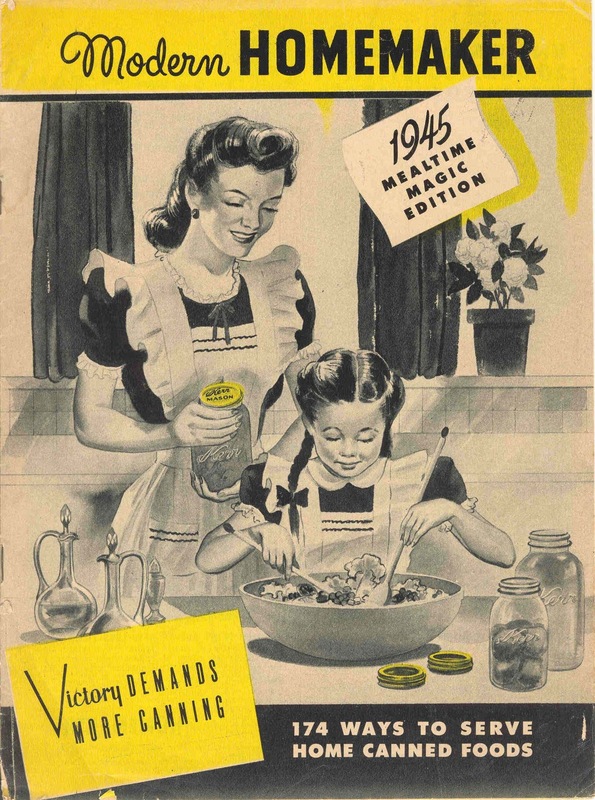 Once women were "liberated" from the home and entered the work place in droves, the notion of staying home to be a house wife and raise the children as a sole occupation suffered from the "lame factor." Women wanted "it all" -- a career/life outside of the tiny four walls of their home and escape from the drudgery and day to day of housework, meal planning, sewing, cooking, shopping and other "wifely duties." However, "wifely duties" still needed to get done, so it became more about "the balancing act" and fulfilling all the various obligations that the average woman had on her respective plate. And that can be exhausting....as I've experienced first hand....and somewhat unfulfilling and frustrating to never be able to fully "be" where you are -- home life constantly bleeds into the work world, and the work world constantly cuts into the home life. When we made the decision that I would stay home solely as a "house wife" (such a funny term) in 2004 when we were getting ready to welcome our second child, it seemed somewhat like a "retro" idea. Sure, it wasn't completely unheard of, but the majority of people I knew chose to go back to work and go the daycare/school route after their babies were born, or after the first couple months (or even years) of their child's life. I even remember thinking about a woman in our church who had two young teenagers and was a "stay at home mom" and thinking it was strange that she didn't choose to go back to work and "make some extra money" for the family. After all, what could a person do all day at home anyway with the kids at school all day? Now that I am a mom of four, I can see how you can easily spend all day at home and get little accomplished -- or at best, get a bit more accomplished than the couple hours after work or on weekends. However, my point is that it's not easy either way. There is a plethora of things to do - cleaning bathrooms, vaccuming, laundry, organization, cooking, planning, teaching/playing with the kids, grocery shopping....the list goes on and on. There is always something that needs to be done. And that will never change. However, the change I'm referring to is a sort of "Renaissance of the Home." Maybe it's because many women have lost their jobs due to the current economic recession, or have chosen to stay home because the job they could get would not be worth all the other expenses of taking that job -- either way, there seems to be a lot more moms (and sometimes dads) who are stay at home parents. This current trend has created a revival of sorts of some of the those time-honored traditions of the house wife - sewing, crafting, cooking, couponing, repurposing, etc. I've seen more pins on Pinterest about making your own laundry soap or turning a milk jug into functional items than I can believe. I've also read that the sale of sewing machines (and sign ups for lessons) is at a record high. All this "extra time" has made home-making both hip and relevant again. No longer is it complete drudgery to create a hearty and delicious meal for your family with the existences of Allrecipes and other fun websites to help us make that happen. Dare I say, it's become even adventurous? While I am not churning my own butter or darning socks, I feel like I have learned (or maybe learned to appreciate) some pretty amazing and practical housewifely things. I've mentioned in other posts about learning to sew and how that makes me feel both empowered and connected to women in ages past. The garden that we planted last Spring (our first ever) did the same. In my suburban life, this as "Pioneer Woman" as I get. But, still...I like it! Last night was another one of those moments for me. I successfully made the best pork chops of my life....in a cast iron Dutch oven! Why is this significant, and a moment to revel in? I am the granddaughter of a women who went to work during and after World War II. She was our family's "Rosie the Riveter." She went to work and she never stopped going. My mom and her sisters were one of the first wave of families to experience the "two parents working" phenomenon. As a result, something had to give (as it always does) and no longer did my grandmother have the time (and really, I don't think she had the inclination either) to be Julia Child in the kitchen and produce dinners that took hours of preparation and attention. The advent of the microwave oven made it possible for time-strapped parents to get a hot dinner on the table faster and easier. My mother learned the same style of cooking from her mother and I learned it from mine. I'm not bashing it, because there is a lot of good stuff in there to learn. However, I think my mom would agree (and not take it personally because I looove her and am grateful for my childhood upbringing) that our meals growing up were filling and good but simple fare of meat, potatoes, spaghetti, etc. It's stuff that I continue to cook for my little family -- because it's good and it works. However, in the last few years, I've tried to branch out to make other foods from other cultures. Being able to travel and live overseas has introduced my palate to other flavors and ways of doing things. It wasn't until I lived in Greece, that I realized that my mom didn't cook with garlic -- which upon investigation I learned was because of my dad's distaste for it. I didn't know it was missing until I "found it." I'm no chef, but I figure since we have to eat, I might as well try to do it well -- as good as I can manage with the time I have allotted. And that has led me to the cast iron Dutch oven. I'm not sure how I decided I needed one...probably one too many magazine articles or t.v. cooking shows about them, but I did some research online and found the one I wanted on Amazon. It wasn't in our household budget, so, I asked for it for Christmas. Since then, I've been getting used to it (how to season it, how to use it) and have made a few dinners in it. I also got a cookbook with it and have enjoyed reading about the history of cast iron and its benefits. Did you know that cast iron ware made its big foray into modern day cooking in the 1800's as families trekked across America to homestead the Western part of the U.S.? No covered wagon was complete without a cast iron skillet and no 49-er panning for gold would be without a dutch oven hanging over their fire. Cast iron pieces were passed down from generation to generation. Women would anticipate the day that their grandmother's iron skillet (perfectly seasoned after all those meals and all those years) would one day become theirs...it was a right of passage....an heirloom. Did you know that there was relatively no anemia issues either? Enough trace amount of iron were added into the food that people didn't have that problem...scurvy...well, that is another story. I have never been able to make a successful pork chop. Whether I cook them in the oven, on the stove top, in the crock pot, they always turn out dry or fairly bland. One of the reasons that I decided to try the dutch oven was because of what I read about how it produces "tender and intensely flavored food." So, it was with great excitement that I thawed some pork chops last week and then found a recipe that sounded mouth-watering and got to work. An hour later, I opened the lid of the dutch oven and breathed in some kind of wonderful. As I cut into the chops to make smaller portions for the kids, I couldn't resist spearing a piece to sample. Didn't get a good photo right when it finished. Everyone was too hungry to wait! I've NEVER tasted a pork chop so utterly tender, juicy and tasty. Succulent is the word to describe that party in my mouth. My husband took his plate gratefully and afterwards he told me, "that was the best pork chop I've had....ever!" My cast iron dutch oven dream came true that night....a dream I never thought I would have or ever want fulfilled. And even though my grandmother did not pass down a cast iron dutch oven to me, I can pass mine on to my grandchildren. And I really, truly love the idea of that. Next up...making sourdough bread in my Black Beauty....yes, I named my dutch oven. It just goes to show you that everything comes back around (although some would argue that they never truly "left"). I'm just glad I'm a part of this homemaking revival!